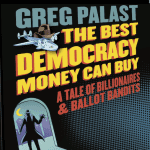 Investigative reporter, Greg Palast’s film The Best Democracy Money Can Buy, uncovers the many methods used to suppress votes across the United States. KBCS News Director Yuko Kodama spoke with Palast. Click here to watch the film, The Best Democracy Money Can Buy for free through election night and get a free comic book.